Hi there! I am just stopping by with a super quick post to share a card made using the HedgieHugg Bugg image from www.tiddlyinks.com. This is my submission for this week's challenge at the Tiddly Inks challenge blog which is due in (hangs head in shame...lol) about 30 minutes. Nothin' like waiting until the last minute, right!?! I hope you are having a great week so far! P.S. Don't miss out on entering to win my blog candy. Click here for details. Oh this is cute!! 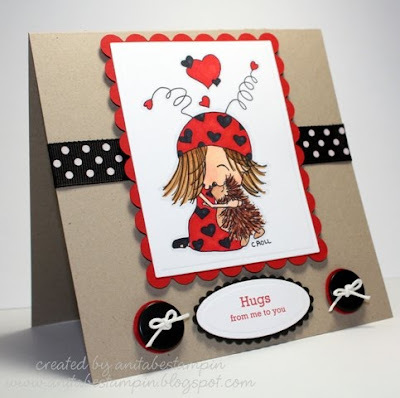 I love love love the craft cardstock with the black and red! Gorgeous!